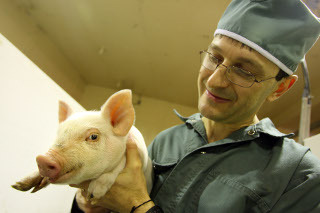 Whether it's advanced studies into the physiology and genetics of fertility, or the examination of new forage sources for lactating dairy cows, the development of on-farm software for decision making, or the production of transgenic pigs for use in medicine, our researchers are at the forefront of their respective fields, many of them internationally renowned experts. Applications for our various domains range from traditional livestock production to the use of animal biotechnology for the betterment of human health, and provide an ideal training ground for the researchers of tomorrow. In addition to our excellent researchers, the department also has access to state-of-the-art resources and facilities for teaching, research and demonstration purposes. Broad research areas are listed in the following sections, and additional information can be found by subsequently viewing individual researcher pages or contacting them by email.